A group of more than 20 advocates gathered outside U.S. Immigration and Customs Enforcement’s Southwest Washington headquarters on Wednesday to protest the mistreatment they say undocumented LGBT immigrants experience while in ICE custody. Members of United We Dream, an immigrant advocacy group, joined members of Casa Ruby, the Trans Women of Color Initiative and the Queer Undocumented Immigrant Project who marched down 12th Street, S.W., with a cage, transgender flags and banners as they chanted “not one more deportation” and other slogans in English and Spanish. They also urged ICE, which is part of the Department of Homeland Security, to stop detaining undocumented LGBT immigrants. Lisa Barrios, a trans woman from Honduras who fled her Central American homeland because of persecution she suffered because of her gender identity and race, said in Spanish she “was stigmatized” while in custody at the Joe Corley Detention Facility outside of Houston that is run by the GEO Group. Barrios noted that she was not housed with other detainees while in custody because she is trans. Marichuy Leal Gamino said guards at the Eloy Detention Center, an Arizona facility run by Corrections Corporation of America, another private company, sexually assaulted her while in their custody. She said an LGBT detainee recently committed suicide. Marcial David, an LGBT Honduran of African descent who said he fled his homeland because of persecution, said as he spoke in Spanish outside ICE headquarters that he was detained at the Elizabeth Detention Center, a New Jersey facility that is also operated by the Corrections Corporation of America, for nine months in 2014. He said he and other LGBT detainees were placed in a “pod” where they were segregated from the general population. David also noted they were not given recreation time while in custody. “We are looking for opportunities in this country because we think that this is a free country for the entire community,” he said. Lourdes Ashley Hunter, national director of the Trans Women of Color Initiative, and National Center for Transgender Equality Executive Director Mara Keisling are among those who also spoke outside ICE headquarters. 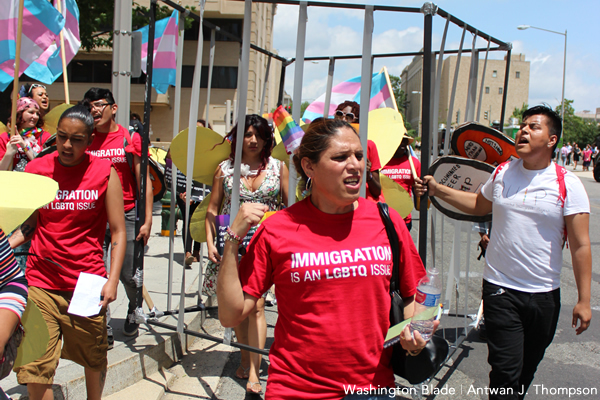 Advocates have frequently criticized ICE over the way they feel undocumented LGBT immigrants are treated while in detention facilities, especially those that privately run. Casa Ruby CEO Ruby Corado told the Washington Blade in 2012 that a gay undocumented Peruvian immigrant’s family members had contacted her because their relative was not receiving proper treatment for post-traumatic stress disorder while he was at an ICE detention center in Louisiana. Other advocates have frequently complained that trans detainees are unable to receive hormones. ICE Press Secretary Gillian Christensen told the Blade on Wednesday that her organization since 2009 has implemented a number of reforms that include “ensuring quality medical and mental health care, protecting vulnerable population and carefully circumscribing the proper use of segregation.” She said ICE recently issued a directive that “established agency-wide policy and procedures for responding to incidents or allegations of sexual abuse or assault of individuals” who are in the agency’s custody. Christensen told the Blade that trans detainees who are receiving hormone therapy prior to their detention can continue to receive it while in ICE custody at no cost. “ICE is committed to upholding an immigration detention system that prioritizes the health, safety, and welfare of all of those in our care in custody, including lesbian, gay, bisexual, and transgender (LGBT) individuals,” she said. As they say, ‘the proof is in the pudding’. Secretary Christensen, we’ll believe you when we have the proof of your statement from the mouths of your victims. I just don’t see why LGBT should get a free pass. There are many people trying to fix status in this country what makes you special? And another thing this article pointed out is that you are segregated in jail because you run a potential risk of being hurt or abused by other inmates. Not because your less. I disagree 100 % with this protest.